The Photos app opens whenever I plug in my phone. I have seen many solutions for the old iPhoto app that involve changing the "Connecting camera opens" option, but the new app has no such option. With the iPhone plugged in, open the Image Capture app on your Mac. In the Image Capture window, left lower corner, choose which app should automatically open when you plug in your phone, chose "no application"
This sets a flag to tell the system to not activate ImageCapture or Photos or iPhoto when a hot plug of an iOS device is detected. Just launch iPhoto, it's still in your Applications folder (if not try the Purchases tab in the Mac App Store app). The same old "Connecting camera opens" option is still there and still works. Not the answer you're looking for? Browse other questions tagged macos applications photos.app . 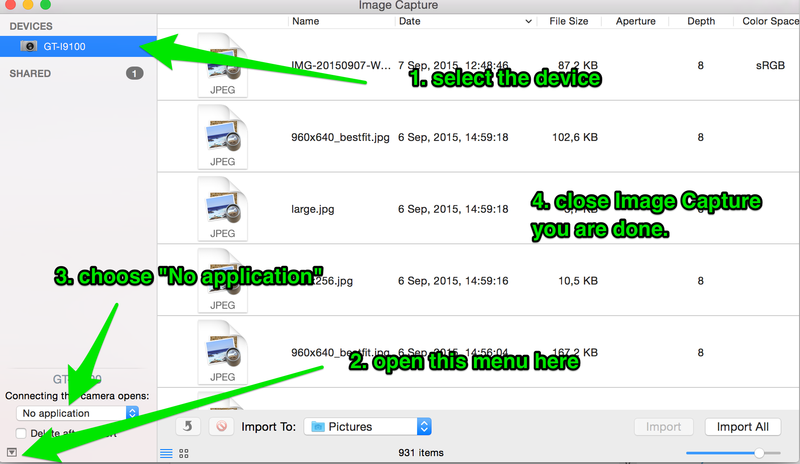 How do I remove or disable the Photos app in El Capitan? Why does my Mac (Mavericks) always try to import photos on boot? 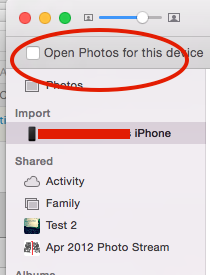 How to remove photos from a device which have been imported previously in iPhoto? Can Photos app on OSX sync faces (or People)?